We are family owned and operated. 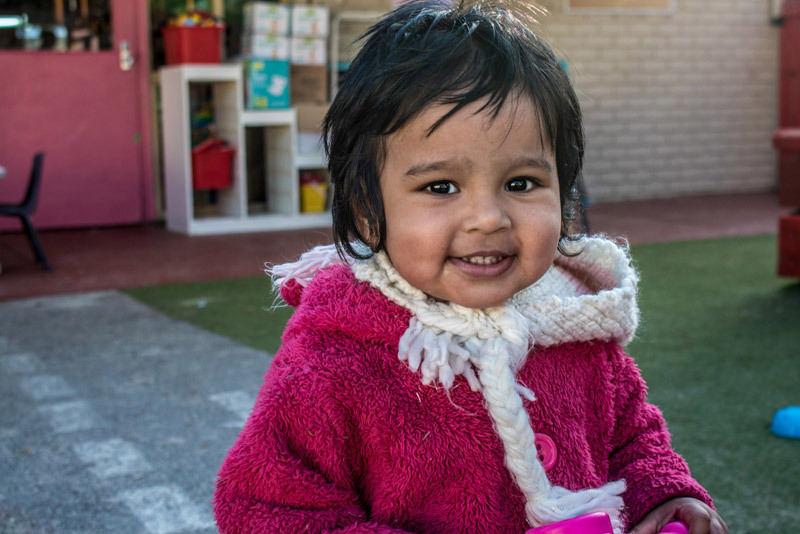 We are so passionate about early education and giving children the best start to life. We are more than a centre, we are a community; you will notice the difference. 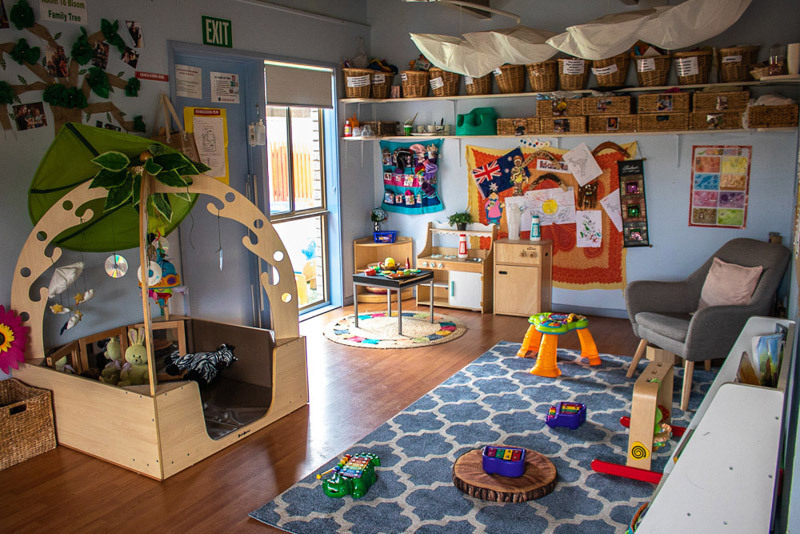 Blending elements of two exceptional teaching philosophies – Montessori and Reggio-Emilia – we have created a truly balanced learning environment. Lots of play, hand-in-hand with structured school preparation experiences. We regularly venture out into the wider community as well as inviting special guests in to provide captivating incursions. Day-to-day, our children’s garden forms the basis of a host of activities designed to build engagement with sustainable practices. We even offer childcare for those rare date nights! And so that you don’t miss out on any of the excitement from your child’s day, we use our own Storypark community to keep you updated on all the fun and milestones. Memories you can share with your whole family. Our programs are exciting, investigative and fun, with learning and play firmly intertwined. 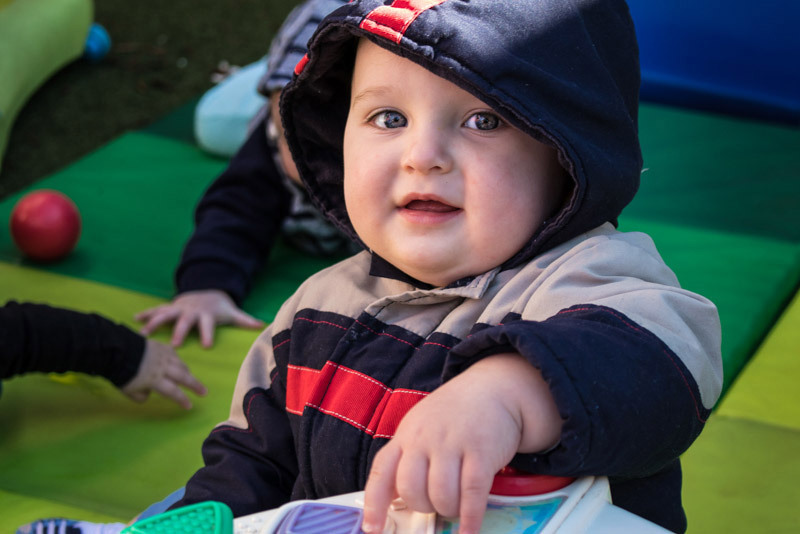 Informed by the National Quality Framework, our activities, resources and routines incorporate principles from both the Montessori and Reggio-Emilia approaches to education. Our method, which is reflective of our overall child-centred ethos, is designed to inspire your child to develop a lifelong love of learning by following their natural developmental trajectory. We value social collaboration as well as individual investigation and recognise our own environment as an important tool to inspire their learning. While we support children to develop their understanding, thoughts and creativity in their own particular way – arts, movement, imaginative play, music – we also ensure that we provide structured experiences which will prepare them for school. We understand that in the first five years of a person’s life, more development occurs than the rest of their life combined. Think back to who you were 5 years ago. We are sure you have changed but did you grow 3 feet? Did you learn a new language? Did you make your first friends and learn how to read? Considering this; we know the time we spend with your children is ever so precious and needs to be rich in learning opportunities from the moment they walk through the door. In turn; everything we plan and do has an educational value behind it, look closely at our set ups and programs; you will be impressed with what you see. We understand that you are only a child once and it should be fun. We also know that learning can be fun hence there is never a dull moment at Kids World. We love excursions to place like the zoo, the aquarium, farms, parks and so many more places. There is so much fun and learning that occurs at our centre but we know that there is so much more out in the world and we intend to help our children experience as much of it as they can. We like to think we make choosing childcare easy for parents. Because, quite simply, we go above and beyond to ensure that your child feels happy, secure, engaged and is achieving their full potential. 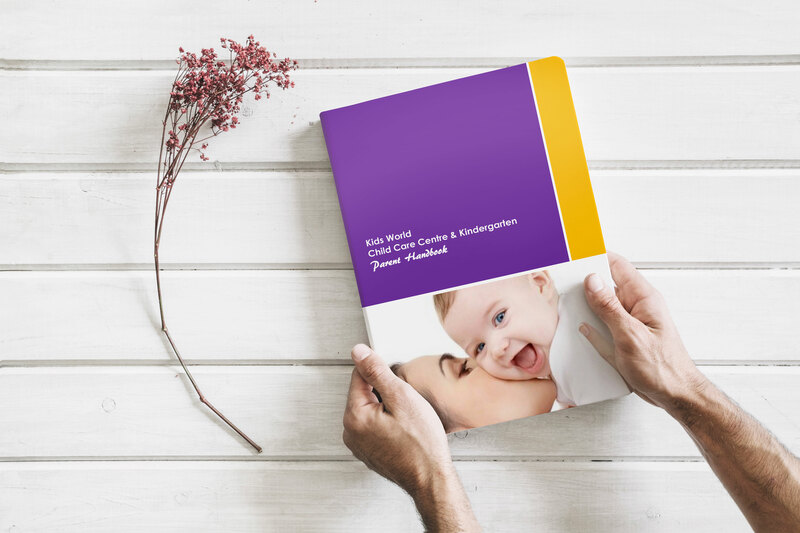 It’s also important that you, as parents, feel informed and confident, which is why we provide a Parent Handbook. This offers greater detail on Kids World, as well as broad guidance around the transition to long daycare. If you have any other questions, please get in touch. We look forward to welcoming you and your child to the Kids World community. 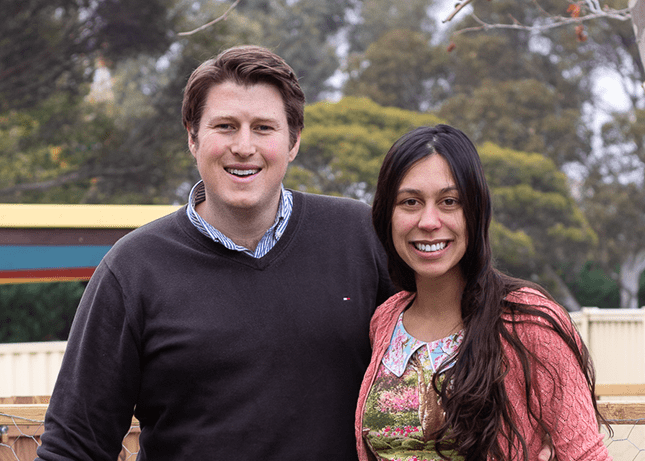 Owned and operated by Kieran and Karen Armstrong, Kids World is all about family and community. Its wraparound ethos blends the warmth and nurturing qualities of a family daycare with the opportunities and facilities typically afforded by a larger nursery, creating a truly unique service for local children and families. Kieran, who has worked in the early education sector for over ten years, holds a degree in Psychology, majoring in child development. While Karen is a practicing midwife and nurse, and is currently studying a Diploma in Children’s Services. 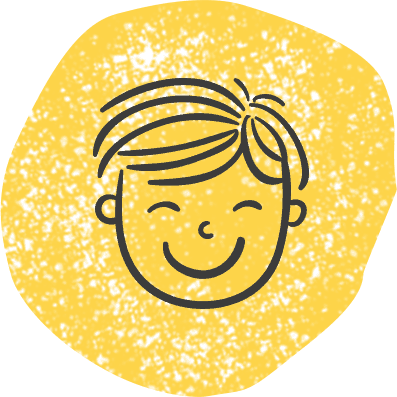 We’re proud to say that once Educators join Kids World, they never want to leave. That means we have a hugely experienced and deeply committed team providing a caring and consistent environment for your child. All of our Educators have completed formal qualifications that exceed the minimum level of study required to work in early childhood services. They are also required to maintain a current Working with Children Check from the Department of Justice, as well as training in First Aid, Asthma Management and Anaphylaxis Management. We welcome volunteers who wish to develop skills in childcare, or who simply want to make a difference in young lives. We offer a range of fully supervised voluntary roles, with all applicants required to maintain a current Working with Children Check from the Department of Justice. 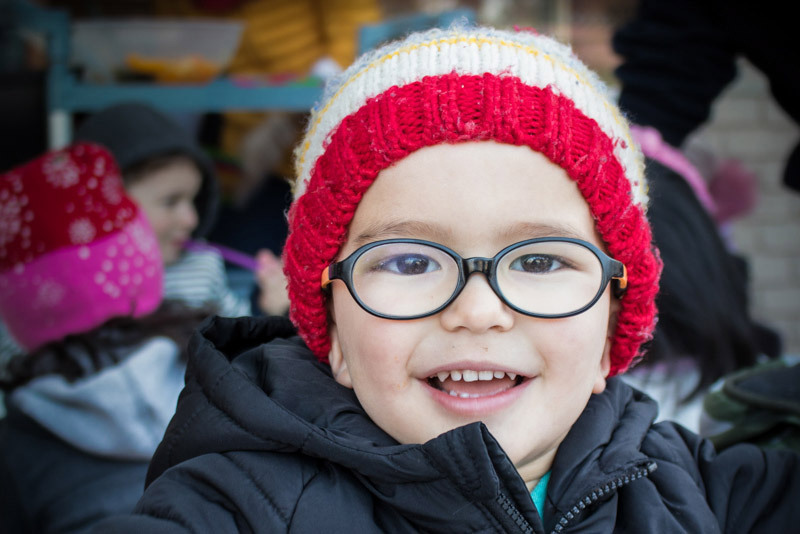 We expect our volunteers, like our staff, to understand just how important a part they play in children’s lives – caring for them physically and emotionally and supporting them to develop mentally and socially. A space for our little ones. 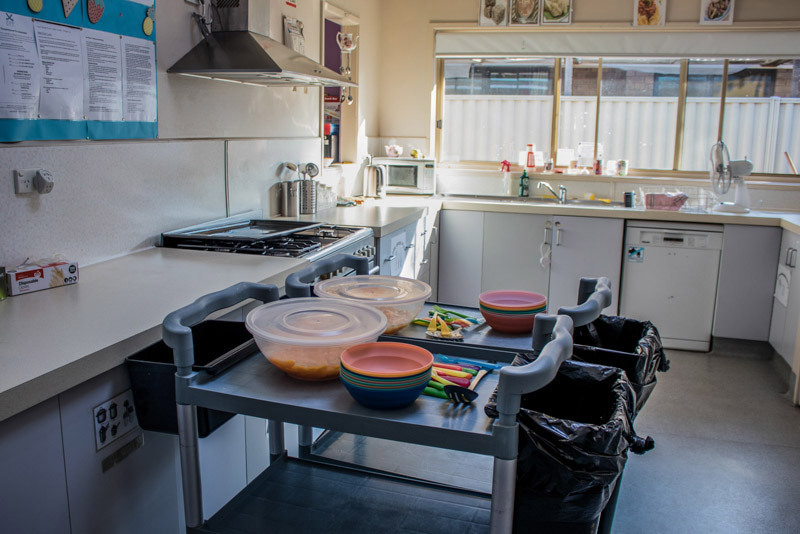 This room is so calm and welcoming; it has purpose built nappy change facilities and a safe bottle preparation area to ensure our Educators have everything at their fingertips to look after our youngest people. There is a dedicated cot space that is cool, tranquil and comfortable to optimise sleep and help those little brains develop. Our babies even have their own yard specifically designed to help gross and fine motor skills develop in the early months. This is truly a beautiful space for our little ones. A space for our slightly bigger little ones! This room is a one-year old’s paradise. We have organised our room specifically to help our children build on those walking and exploring skills. There are safe and low climbing structures, plenty of furniture to lean on as they perfect walking, easy access to nappy change and bottle areas and even a couple of children’s toilets for those children ready to begin potty training nice and early. There is a beautiful outdoor space that the children share with the 2-3-year-old peers to help challenge them to improve their growing skills. As our children get older; our rooms evolve. You will notice lots of different levels in Perth so children can practice heading up and down those stairs and building that depth perception. There are many common areas as we introduce our children to structured group time and learning activities in a fun and welcoming setting. The toys are a little more challenging as we develop those fine motor skills, but the space is just as welcoming as our younger two rooms. There is a dedicated nappy change room and access to more children’s toilets to help with the transition out of nappies. We share a yard with the 1-2-year-old children which helps us develop empathy and improve our emotional intelligence. We’re getting to the big kid’s rooms now! 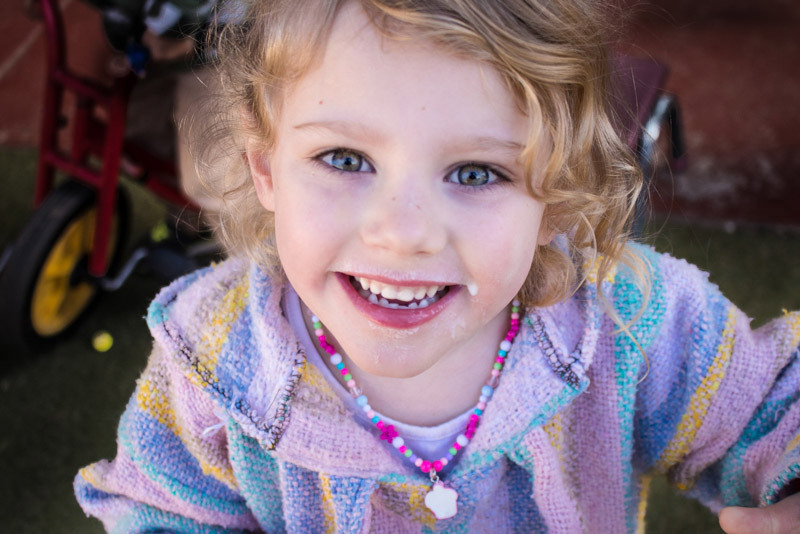 We run our amazing three-year-old kinder program out of our Brisbane room. Lots of challenging puzzles, art and craft stations and a plethora of other experiences are on offer here as we develop our children’s attention span and focus. We have many group time sessions through each day as we really ramp up the preparation for primary school. 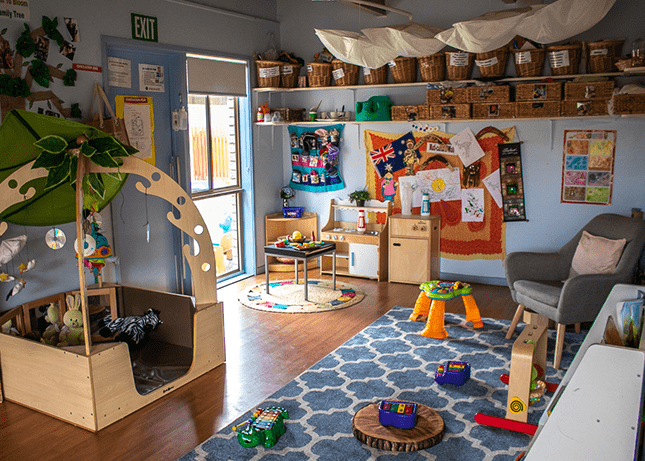 This room and beyond is when you will really start to notice the Montessori and Reggio influences enter our teaching approach as we ensure strong intentional teaching is occurring. We share our beautiful, big yard with the 4-year-olds which will help challenge our three-year-old during their journey to be ready for school. 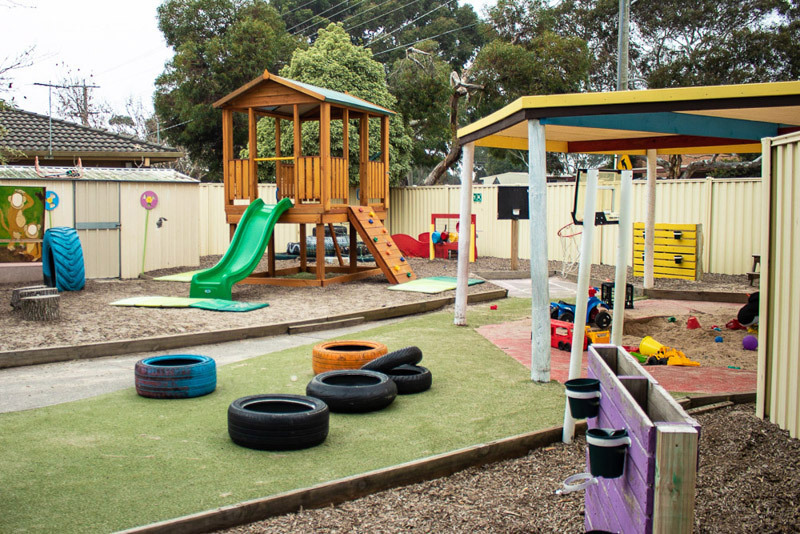 The play spaces set out in our big yard are age appropriate and stimulating for our 3-5-year old children. Our Hobart room offers great education and care for our 4-year-old children. This room is designed to help prepare children for school with really defined areas. 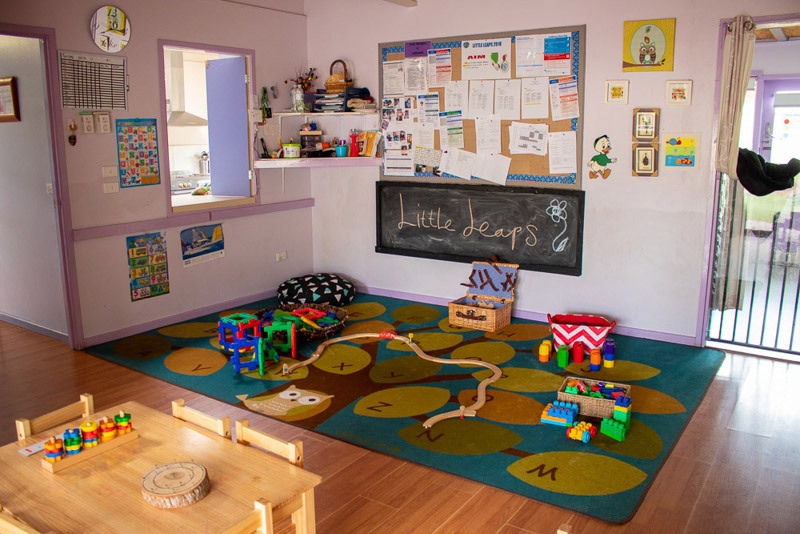 You will notice the Montessori influence all through the room from the bag hooks all the way through to the specific math, language and science areas. Our yard is again designed for the 3-5 year old age group and the vary ages also helps prepare children for schools as they will soon be sharing yards with children almost 6 years older/younger to themselves. Our Sydney room is our jewel in the crown. This room is designed and reserved specifically for our funded kinder children. We are so happy that we can offer a flexible and convenient alternative to council kinder at such high quality. Our degree qualified Kinder Teacher has set up her room to challenge, excite and educate our kinder children in their final year before primary school. 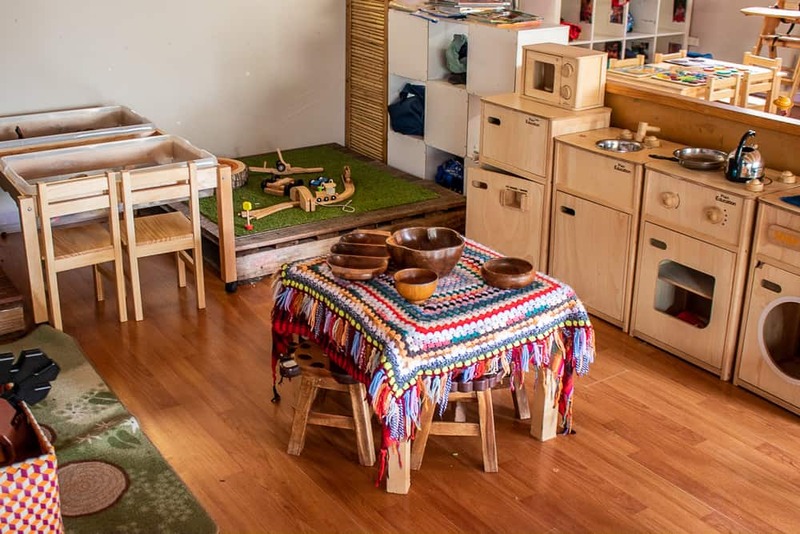 They have access to the 3-5-year old play space but also access to their own special kinderGarden where you can see ongoing Reggio inspired projects in action. We are really pleased to offer this extremely high-quality program as an alternative to council kinder. 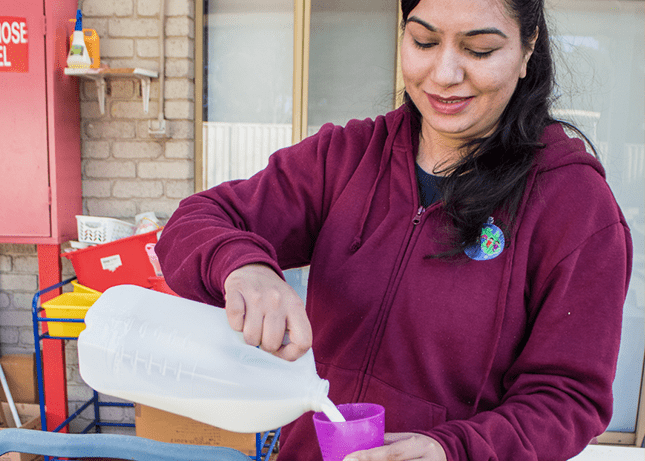 Because we believe in nourishing little bodies as well as minds, Kids World provides delicious, freshly cooked meals – breakfast, morning tea, lunch, afternoon tea and a late snack – as part of our daily routine. We also feed rumbling tummies as required in between times, because busy kids need all the fuel they can pack in! Our meals are included in your child care fees and Educators keep a daily log of what your child eats and when, which you can see at the end of each day. 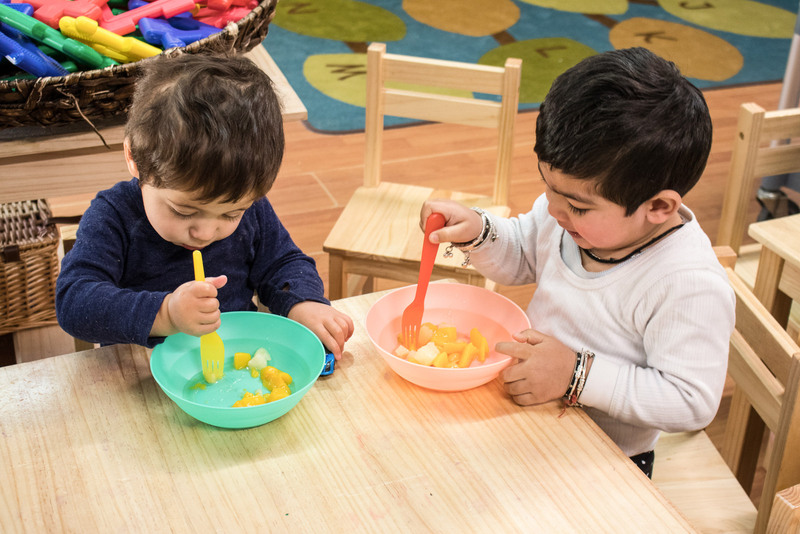 While we encourage children to try different types of food, alternative options are provided if a particular meal is adamantly refused and Educators do ensure that every child is adequately nourished. Our tasty meals, which meet national nutritional guidelines, are prepared on-site by our cook, who is also a trained Food Safety Supervisor. Menus are displayed in the foyer just outside the kitchen, and we encourage your feedback to help us develop healthy, interesting and culturally diverse meals. 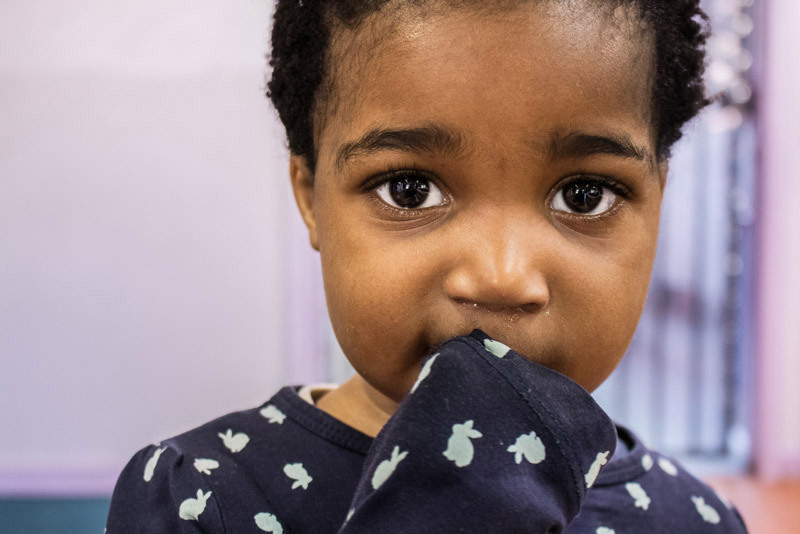 We support all feeding choices, providing a comfortable area for breastfeeding mums who wish to return the centre, facilitating storage of expressed breast milk and preparation of formula for your child throughout the day. Please note that, for the safety of all children, we prefer parents to avoid bringing food into Kids World. 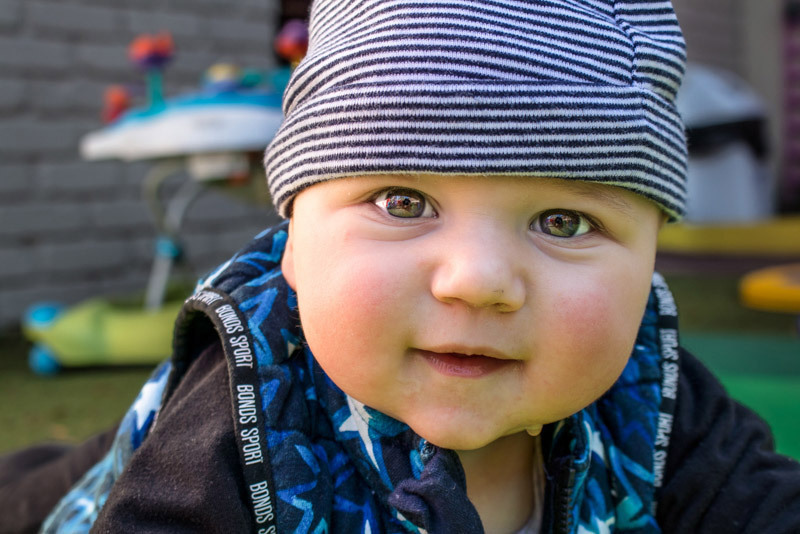 We will do our best, so far as is practicable, to support your child’s dietary needs, including allergies and intolerances, cultural or religious restrictions, or individual preferences. At Kids World we jump, run, dig, splash and slide our way through the day. Because the outdoor environment is so important to your child’s physical wellbeing and understanding of their role in a sustainable future, we make sure to offer them a wealth of open-air activities each and every day. 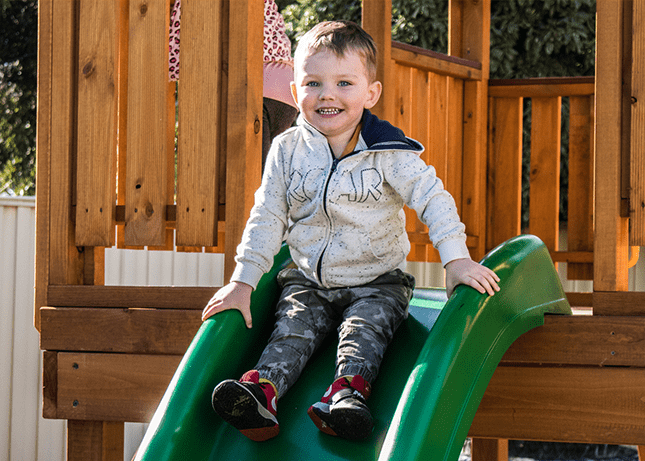 We have three separate outdoor play yards, fully equipped with age-appropriate experiences, allowing your child to immerse themselves in everything from gardening and water play to challenging physical activities. Our belief in a shared responsibility towards the environment, and the need to build a sustainable future, is an important aspect of our educational program. Through our children’s garden we chart the cycle of crops, engage the children in sorting food scraps, teach them about composting and talk about the importance of water, energy and non-renewable resources. We also encourage parents to reinforce the lessons that your children are learning at Kids World, by practicing them in the home – recycling, gardening, conserving energy and water and purchasing sustainable products.